a) The annual dues will be determined by majority decision of the Executive Board, approved by the membership at the November meeting, and posted on The Guild website. b) Annual dues are payable in January. A member whose dues remain unpaid by March 1 shall be dropped from membership. Members joining after July 1 will pay a prorated amount. a) The annual dues will be determined by majority decision of the Executive Board, approved by the membership at the September meeting, and posted on The Guild website. b) Annual dues are payable by November 30th. A member whose dues remain unpaid by January 31st shall be dropped from membership. Members joining after July 1st pay a prorated amount. For questions regarding the bylaw proposal, please contact one of the Board Members. 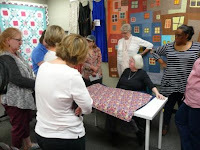 Our April meeting was a success......the rotating demonstration tables featured two very different sewing techniques -- raw edge applique with Faye Jones and sewing facings with Lynne Harrill. Both demonstrations visually provided steps and application that we can takeaway and utilize in our quilting and other sewing projects. 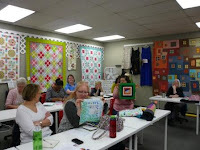 Thank you Faye and Lynne for coming so prepared....your quilt exhibits used to teach us were wonderful!! We also thank Paige Alexander for donating the Sewtopia Swag door prize giveaways. Several of us went home with an added treat. Enjoy. 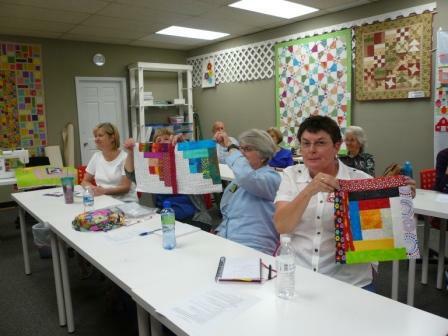 We are having a workshop with our own GMQG member - Cindy Lammon who will be teaching Beginning Machine Quilting. If you have not met Cindy, checkout her blog at Hyacinth Quilt Designs. 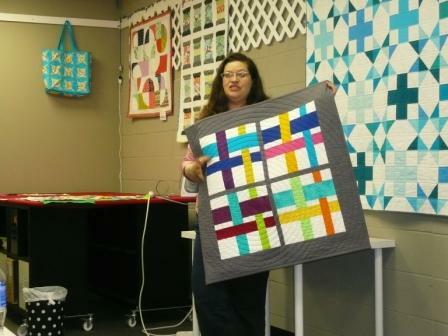 She is an avid quilter, author and teacher. It is a workshop not to be missed. Cheryl will be emailing the supply list for this workshop in the next few days, so be on the lookout. One of the neat features of Show & Share is the story that inspires each project.....and this month we had a wide range from a sewing conference, anniversary celebration, trying out a new technique, special fabric, niece going to college, to giving us a sneak peek on a next project. Our Block of the Month challenge is.........String Block. Faye only had one criteria --- finished dimension size measure 12.5 x 12.5. So, that means any color quilt fabric can be used....this is a great way to use those extra pieces of fabric from other projects. Who constructed a Log Cabin this month? 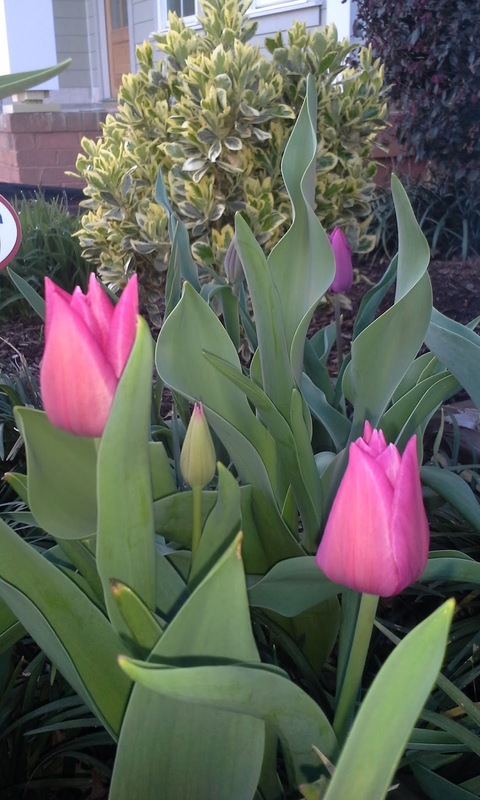 Raise your hand.......Thank you to all the March Block of the Month participants -- look at the beautiful colors. Your time and sewing participation does make a difference. Faye Jones reported that we now have completed seven (7) philanthropy quilts for the Greenville Hospital Quilts for Kids. One of our volunteer quilters, Valerie Kasten, took four (4) of the January Block of the Months to make the quilt she brought to show us. Silk Batik Scarf Workshop by Faye Jones. Faye may have one or two slots still open so if your interested please email Faye at birdie1345@aol.com to coordinate. The cost of the workshop is $15. 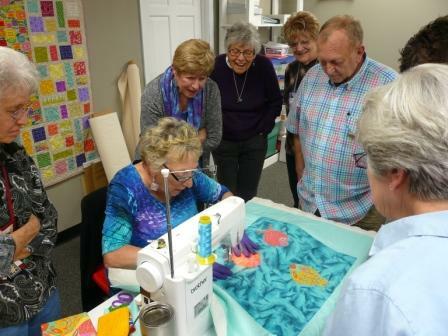 Workshop- Beginning Machine Quilting with Cindy Lammon - May 14th from 10:00a.m. - 3:00pm. at Bernina Sewing Center. Cheryl Brickey will email the supply list. Specialty Ruler Discussion + Paige Alexander introduction and announcement for GMQG Challenge - June 11th from 1:00pm - 3:00pm --- And, as always, bring your Show & Share. The Charleston MQG is happy to host Latifah Saafir for 2 workshops this summer in Charleston. Latifah is from LA where she co-founded the LA MQG and the International Modern Quilt Guild. She is known for her bold and innovative designs and we are super lucky to have her here to teach both her Molehills and No Latitude (Bias Tape) Quilts. We would like to extend invite you any of you who might be interested. The details for class days, times, and costs are in the picture below. Please visit the website charlestonmodernquiltguild.blogspot.com for additional information on classes, cost, and contact information to register. Space is limited and your nonrefundable spot it guaranteed upon payment. We are super excited to have her and would love to see and meet others in our area for these workshops. We invite you to join GMQG for our next gathering on Saturday, April 16th instead of our usual 2nd Saturday of the month because the Foothills Piecemakers Quilting Guild Quilt Show is this upcoming weekend. On April 16th, GMQG program will feature multiple small rotating demo stations for "raw edge applique" with Faye Jones and "facings" with Lynne Harrill.